NATCHITOCHES, La. 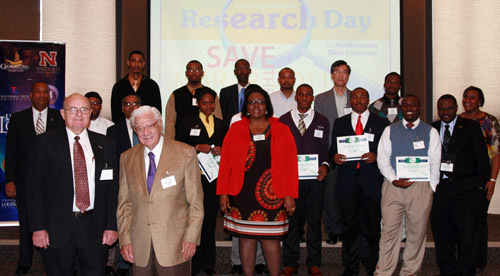 – Over 60 students participated in the first annual University of Louisiana System Undergraduate Research Day held on Northwestern State University’s campus on March 18, 2011. 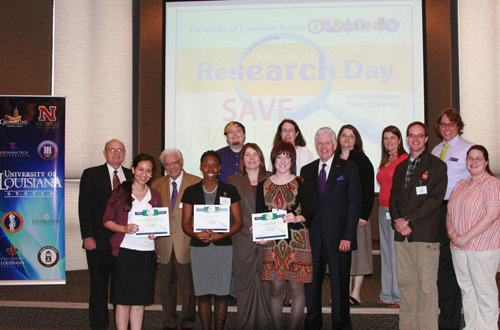 All eight UL System universities were represented in the 39 student research presentations, and students from McNeese State University and Southeastern Louisiana University won the juried art show. 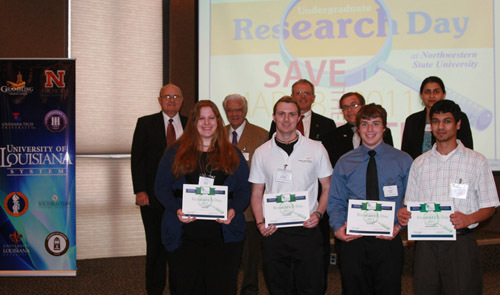 “This event was exciting and really showcased what our system is all about: students. Research days are prolific on our campuses, but this was significant as we came together as a system to share experiences, findings and, hopefully, opened the door for cross-campus collaboration,” said UL System President Randy Moffett. As part of the day, faculty members were invited to hear about national practices in undergraduate research from Bill Campbell, President-Elect of the Council for Undergraduate Research (CUR), a national organization representing over 900 colleges and universities. Campbell, who attended several student sessions, also addressed the students over lunch. 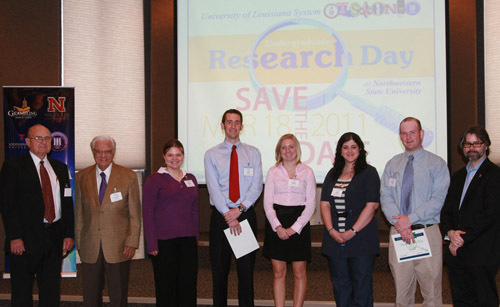 “In my view, the first UL System undergraduate research day was a complete success. 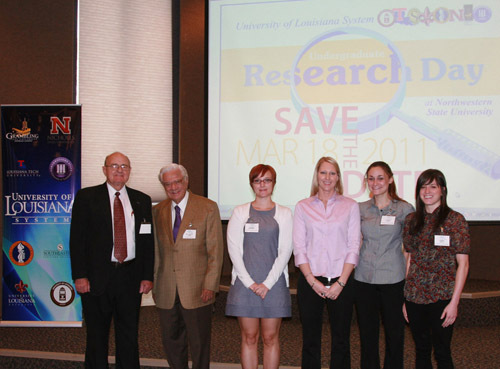 I was very impressed with the students whose presentations I attended, and also by their faculty mentors. 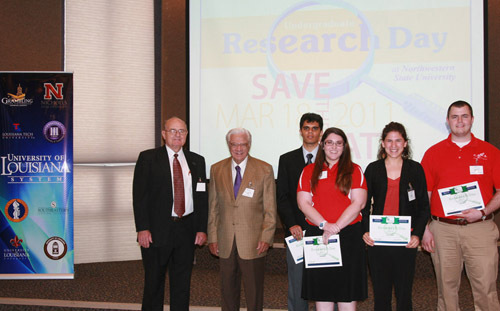 I hope to come back for next year’s Research Day at McNeese,” said Campbell. As this will be an annual event for the UL System, campuses have already lined up to host the next three years: McNeese in 2012, University of Louisiana at Monroe in 2013 and Nicholls State University in 2014. 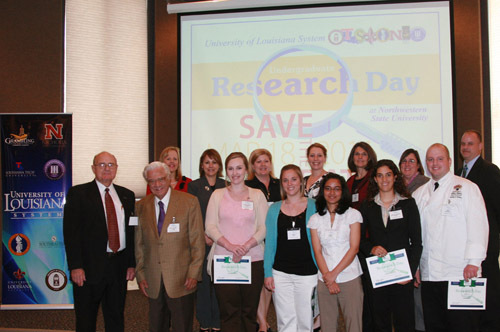 Additionally, the System has decided to merge Undergraduate Research Day with the UL System Service-Learning Conference to make it an annual two-day event each spring. “I cannot think of a better way to celebrate the exceptional student learning experiences going on at our universities than to bring service-learning and undergraduate research together. This will be a hallmark event for our system for years to come,” said Moffett. Below is a complete list of student participants by university, including presenters and artists. Group photos of each university’s participants with Board Chair Winfred Sibille and Board Member Jimmy Long are above. Support our mission to enhance the quality of life for Louisiana's citizens.